This film follows high schooler Greg, who spends most of his time making parodies of classic movies with his co-worker Earl and finds his outlook forever altered after befriending a classmate who has just been diagnosed with cancer. KIDS FIRST! Film Critic Raven D., comments, “This film is beautiful, truly a must see for not only teens, but adults as well. It is so refreshing. It’s very rare that I find a movie that depicts what it’s like to be a teenager and grow up in this day and age with such honesty and genuine emotion.” See her full review below. 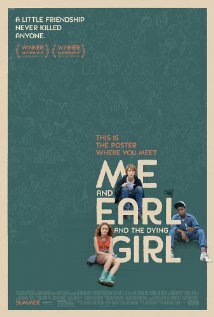 Me And Earl And The Dying Girl is a funny, yet a sad movie that will make you want more. This live-action, dramatic film is about a high school boy named Greg (Thomas Mann) who is forced by his mom (Connie Britton) to hang out with a girl named Rachel (Olivia Cooke) who has leukemia. Now Greg and his coworker Earl (RJ Cyler) have to help Rachel feel better. The three main characters have good team chemistry and you can see how much they bond throughout the film. My favorite character is Earl because he is very good at having comedic timing and also a lot of emotion. There are also a lot of relatable moments in the movie, such as when Greg is in the cafeteria talks about all the different groups. That made me think of my own school. The director, Alfonso Gomez-Rejon, is amazing at creating unique screen shots. A place where you can see this is in all the little film parodies Greg and Earl make of classic films. You get to see how they make the classic films in their own unique ways by changing the title or adding some new things that weren’t in the film. The music by Brian Eno and Nico Muhly is very pretty and fits with what is happening in the movie. The art department did a fantastic job on making everything look beautiful and having a lot of interesting art. A place where the art was gorgeous was near the end they had some cut books and they were very detailed and it looked like they took a lot of time on it. The set done by Diana Stoughton looks very fitting to the story and reflected on how everyone lived in a poor neighborhood. My favorite part of the movie is the ending, but if you want to know why then go watch the movie. The message of the movie is don’t give up, even when all hope is gone. I would recommend this to the ages of 13 to 18 because there is drug usage, cursing, and sad topics. I would rate this 5 out of 5 stars.